John Duffy was delighted by Rovers' performance against Leigh. John Duffy has heaped praise on his Featherstone Rovers players following their stunning win over Leigh Centurions on Sunday. Rovers were only able to name a 15-man squad last Friday before Dakota Whylie failed a concussion head test before Sunday’s clash, leaving Featherstone with just 14 players. But despite having just one interchange on the bench, Duffy’s men overcame the odds to move themselves back to the top of the Championship Shield standings. 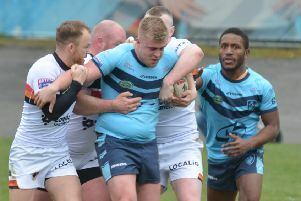 Featherstone now need seven points from their next four games - against Sheffield, Dewsbury, Swinton and Barrow - to secure home advantage in the Shield final. “It was a top performance from us, it was real backs-against-the-wall stuff,” said Duffy. When asked if he had ever been so low on numbers, Duffy continued: “I have not, I have definitely not been in that situation before. “We have coped with it this season where we have had a couple of injured players on the bench, so I guess we have done it before. “Unfortunately, Dakota Whylie failed his head test before the game and that put us down to just 14. “But we have had a right dig, and I am just real proud of all the players and staff, and the supporters because it has been a tough couple of months. “It is tough to get through a normal team session when there is not many people out there. “But the players had a great week in training, really bought into things, their attitudes have been first class all week and it really showed. “The players have been superb and their attitude has been first class and they took that into the game against Leigh. We had to have a look at our middles and rotate a bit sooner than we normally would, just to save energy. “We tried to kick the ball out as much as we could to slow the game down. “We knew that we had to slow their middles and be really good with our detail in collision because the likes of Micky Higham is devastating off the back of a quick ruck. “I thought we were really good at that and sticking to our tip sheet, it was a great performance from the boys and it is all about them. Rovers’ attention now shifts to tomorrow night’s clash against Sheffield Eagles at Olympic Legacy Park. The Eagles have won just eight of their 26 games so far this season and lost their last outing, 30-20, against Dewsbury Rams last Friday. Featherstone have scored 118 points in their two regular season games against Sheffield in 2018, conceding just 20. But Duffy is keen for his players to remain focused as they aim to move one step closer to home advantage in the Championship Shield final. “We will be in on Tuesday and Thursday and hopefully go to Sheffield with a couple more bodies,” added Duffy after the win over Leigh. Rovers suffered a further injury scare in last weekend’s clash when Luke Cooper was brought off for a concussion head test. Duffy confirmed that the forward passed that test and should be available for the trip to Sheffield.